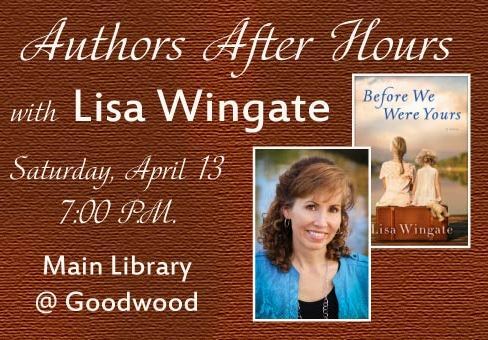 Adults are invited to the Main Library at Goodwood at 7 p.m. Saturday, April 13, for a FREE Authors After Hours event featuring New York Times Bestselling author Lisa Wingate! A former journalist, inspirational speaker and author of thirty novels, Wingate’s work has won or been nominated for many awards, including the Pat Conroy Southern Book Prize, the Oklahoma Book Award, The Carol Award and the Christy Award. She will be at the Library to discuss her blockbuster hit, Before We Were Yours, which remained on the New York Times Bestseller List for more than one year, was Publishers Weekly’s #3 longest running bestseller of 2017, and was voted by readers as the 2017 Goodreads Choice Award winner for historical fiction. A question-and-answer period and book signing will follow the presentation. Copies of Wingate’s books will be available for purchase at the program.